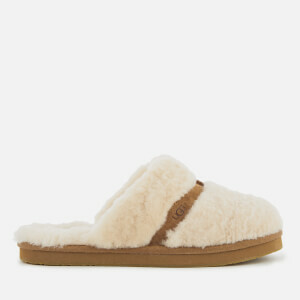 Perfect for indoor chic style, these Women's Scuffette Suede Slippers by Ugg Australia boast unbeatable comfort. Created with a soft suede upper and a sheepskin lining for warmth and a soft feel, these slippers are the epitome of fashion and comfort. The sheepskin cuff and Ugg branding to the side allow instant brand recognition, whilst the cork infused rubber outsole gives indoor durability. K.D. Absolutely amazing slippers! Like wearing fluffy clouds! Got these at such a great price with the extra 20% off sale code! Brilliant! These are great slippers. Good quality, good looking and very comfortable. Easily the best slippers I've ever had...bought them for my mum for Christmas but ended up keeping them and buyer her another pair! So soft and comfy, definitely worth the investment! . I'm a size 5.5 and would buy a size up (I wear a 6.5 in these). Such comfy slippers!! Perfect for around the house, can't imagine living without them now.